Do you want to talk to the jacks of all trades within the sales and marketing worlds? Pull this B2B email list of sales/marketing directors to connect with people who want to get their brands' names out there. Start emailing sales and marketing managers in minutes. Buy email leads of those who need to buy the right ad space or find a marketing solution to get more leads themselves. Directors of sales and marketing departments need a lot of tools and data to know whether or not their campaigns are effective; they also need to keep an eye out for new types of marketing campaigns and trends. If you're trying to show off your software, project management system, or outsourcing service, having a sales/marketing director email list can really help you get your name out there. When you're marketing to marketers and selling to sales directors, keep in mind that these are some of the best B2B sales leads out there and it's important to make a great impression. You can do that by knowing the marketing/sales directors' full names, phone numbers, and accurate email addresses. All of this and more is included in this download-ready, CRM-friendly marketing and sales manager email database. 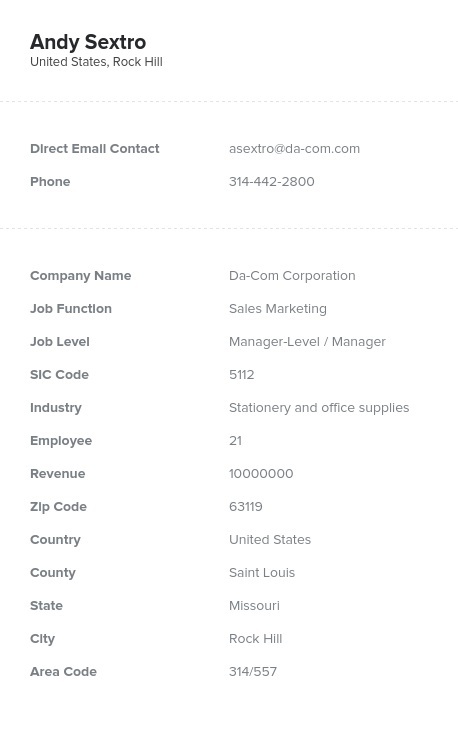 Purchase email lists with real information like this one (or our sales director list and/or marketing director list) to make a better impact and actually sell your ad space or marketing tool! Help directors of marketing and sales departments get more leads while helping yourself with this high-quality business mailing list! Buy this product and start sending emails today.